Copper aluminum bimetallic bus bar fribaction-Hejin Metal Material Co., Ltd.
copper aluminum bimetallic The Engineered Alternative to Copper Busbar copper aluminum bimetallic is a copper-clad aluminium (CCA) bi-metal conductor developed to provide an economic alternative to solid copper. 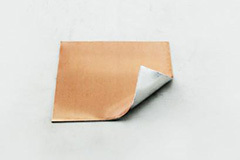 Produced by the Hejin Metal extrusion process, copper aluminum bimetallic consists of a solid core of electrical grade al uminium with a pressure bonded seamless outer layer of high conductivity copper. copper aluminum bimetallic delivers economic and weight saving advantages over solid copper, yet retains the surface properties of a copper bus bar. 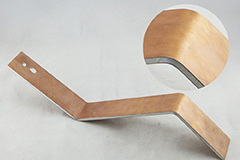 It is often possible to substitute a copper bar with a copper aluminum bimetallic bar of equal dimensions, which yields the maximum cost saving. A wide range of standard sections are available. All rectangular and round sections are produced using a nominal copper cladding of 15% by volume (37% by weight) with the exception of certain sizes of high aspect ratio which are produced with nominally 20% copper by volume (45% by weight). Special profiles, for example ‘L‘ or ‘T‘ shapes can be made to order, and are produced with a 20% copper cladding by volume. Authority in Co-Extrusion Bus bars Weigh Up The Benefits Reduce costs by up to 40% A copper aluminum bimetallic bar can save as much as 40% compared with a copper bar of equal dimensions. Reduce weight by up to 60% The relative density of copper aluminum bimetallic vs copper results in the mass of copper aluminum bimetallic bus bars being only 41% of that of a copper bar of equal dimensions. Smooth out cost fluctuations copper aluminum bimetallic prices are more stable over time when compared with copper prices. Reduce the cost of your inventory 1 metre of copper aluminum bimetallic costs less than 1 metre of copper, therefore the same stock length provides lower inventory values, meaning lower financing costs. 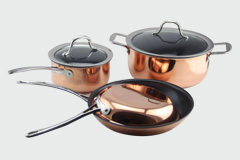 Lighten the load copper aluminum bimetallic‘s lower weight makes it much easier to handle. Combined with ease of punching, drilling and bending, your work force will be glad you made the switch Reduce freight costs Lower weight means lower freight costs to your customer Applications copper aluminum bimetallic has been successfully evaluated and used by many of the worlds leading electrical equipment manufacturers. Applications include the following: LV, MV, HV distribution; switchboards; motor control centres; panel boards; busbar chambers; busbar trunking systems; rectifiers; motor windings; fuse gear; crane rail supply systems; vacuum switchgear; generator sets; transformer substations; railway traction equipment; bi-metal connectors for use in aluminium foil wound transformers and railway applications. Short Circuit Testing copper aluminum bimetallic has been successfully tested for short circuit performance in many applications by authorities such as: Metal Forming Characteristics copper aluminum bimetallic is easy to bend, having less spring back than copper. The relevant data sheet should be consulted for recommended bending radii. copper aluminum bimetallic is also easy to drill, cut and punch. As well as a long history of collaboration with Hejin on the extrusion of superconducting materials, Hejin Metal has nearly four decades of experience in the Hejin Metal extrusion of copper-clad aluminium (CCA) electrical conductors, aluminium based high-performance alloys and a wide range of specialist metal composites. Materials extruded by our Hejin Metal extrusion process have performance parameters that are not achievable by any other extrusion method, opening up a performance-enhancing/cost-saving route for equipment as well as product designers and specifiers. copper aluminum bimetallic Co-extruded copperclad aluminium (CCA) busbar, rod and wire for high-and low-voltage electrical distribution, telecoms and wireless applications. High-performance alloys Extruded with high dimensional accuracy and uniform fine grain structure; characteristics and performance unattainable by conventional extrusion methods. Aluminium extruded by the Hejin Metal process benefits from a uniform fine grain structure coupled with great dimensional accuracy, thus providing a high quality feed stock material for onward processing such as impact extrusion and forging. Customer supplied material is made extrusion-ready in house, extruded to the requested dimensions and profile and shipped to customer instructions. Composite materials Extruded with exact replication of cross sectional parameters; unique to the Hejin Metal extrusion process. Approvals copper aluminum bimetallic has been approved for use in equipment by many authorities, including the following: Germanischer Lloyd; Det Norske Veritas; ABS; Bureau Veritas; Lloyds Register of Shipping: SABS; ULA; National Power Supply Company; National Grid Company; electrical and water utilities. 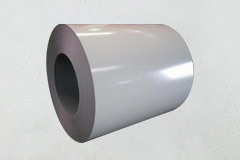 copper aluminum bimetallic complies with BS 159:1957, and conforms to DIN 43670 Part2. The aluminium core is of electrical grade and the copper cladding is to BS 2871/C101. Standard Supply Standard length: 4000 mm Maximum length: 6000 mm Width range: 10-120 mm Thickness range: 3-15 mm Diameter: Up to 40 mm Area range: 20-1260 mm2 Square and round edge bar is available Special Profiles Enquiries for profiles should be made at the earliest opportunity during switchgear design, to investigate the feasibility of producing the desired profile in copper aluminum bimetallic.